Baldacci awards $100K to 4 storm-damaged counties | Bangor Daily News. The Baldacci Report Card | Bangor Daily News. The Baldacci Legacy: Economy tempered ambitions | The Portland Press Herald / Maine Sunday Telegram. Disaster declared for Maine red tide outbreak | Bangor Daily News. Baldacci a B+ on environment, group says | Bangor Daily News. 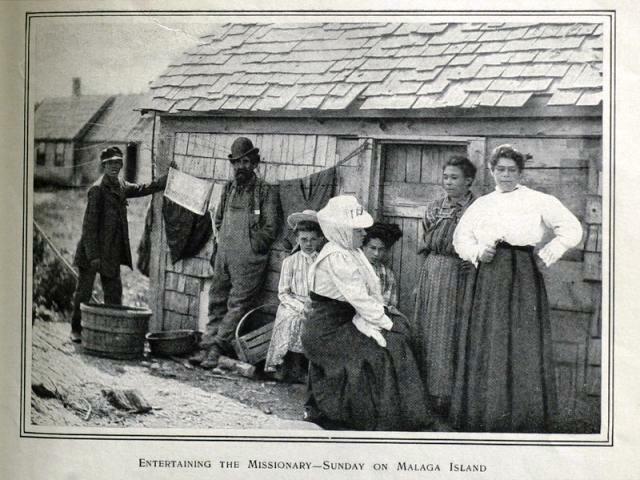 A copy of a photo by Frederick Thompson from Harper’s New Monthly Magazine, September 1882, shows residents on Malaga Island. Yet here they stood Sunday afternoon – elected officials, archaeologists, journalists, human rights activists and, most notably, descendants of the mixed-race families who once called this 41-acre island home – all to hear two simple words. Maybe you’ve heard the story of Malaga Island – and then again, maybe you haven’t. Just a few hundred yards from Phippsburg’s western shoreline, Malaga Island was home in the late 19th and early 20th centuries to anywhere from 25 to 40 people who lived in dirt-floor, ramshackle homes and eked out a living fishing the tides in the New Meadows River and doing whatever menial work they could find on the mainland. Most traced their lineage to Benjamin Darling, a black man who had bought and settled on a nearby island in 1794. Some were black, others were white, still others were a mixture of the two. AUGUSTA, Maine – It was Sept. 10, but a Sept. 11 commemoration was nonetheless in order. Students at St. Michael’s School gathered around the school flagpole Friday morning for a patriotic tribute to the medical professionals who played a critical role in the response to the terrorist attacks of Sept. 11, 2001, on the World Trade Center towers and the Pentagon. Firefighters, police officers and other emergency personnel were the first to respond to those attacks. But medical professionals weren’t far behind them in aiding victims, and the 270-student Catholic school recognized them in a ceremony Sept. 11 last year. “These are the men and women who take care of our sick, our suffering and our infirm,” Principal Jon Caron told students and parents gathered outside the school before classes began. Click here for the rest of the story by Matthew Stone in the Kennebec Journal. EASTPORT, Maine — The Coast Guard’s 41-foot search and rescue boat eased away from the dock Tuesday morning, its batteries fully charged by electricity generated from the waters beneath its hull. Since Aug. 18, a tidal energy generator developed by Ocean Renewable Power Co. has been producing clean, grid-compatible power for the Coast Guard boat. On Tuesday, the renewable power company and Coast Guard officials welcomed dignitaries and local residents to view up close what they described as the first-ever successful implementation of tidal energy at a federal facility. Sauer called Eastport the “Kitty Hawk” of the developing tidal power industry, which has the potential, he said, to become a $1 billion industry in the city. Click for the rest of the story by Rich Hewitt in the Bangor Daily News. WATERVILLE — No matter how important his job or mission, George Mitchell never lets his hometown stray far from his thoughts. After all, it is here that his three siblings and much of his extended family live, and here that his earliest memories were made. “Like most people, I’m a product of my upbringing – my parents, the schools I attended, the community I lived in – so I think my growing up in Waterville has had a large and important role in my life,” he said. Indeed, Waterville is the place where a young man who one day would be asked to step in as chairman of the troubled Walt Disney Co. got his first taste of the free enterprise system, cleaning at the local Boys Club. It’s where Mitchell, who later in life would be called upon to investigate steroid abuse in Major League Baseball, learned to love the game – and the Red Sox. It’s the place where a boy who grew up to be one of the world’s leading diplomats was first recognized as someone who could bring people together. Click for the rest of this story by Amy Calder in the Waterville Morning Sentinel. Snowe, Collins cast key votes as Senate jobs bill clears hurdle – Bangor Daily News.